A nutritious meal for cold winter days! Peel and wash the potatoes, carrots, parsnips, celery, onions and cut everything into evenly (medium-)sized cubes. Clean & wash the leek and slice once longways. Then cut into bits. Remove the outer leaves of the Brussel sprouts and remove the stalk. Wash and blanch them. Then blanch the potato cubes and thoroughly drain the water from them. Heat up some oil in a pan and fry the vegetables in it, then add the vegetable stock. Steam until the vegetables are firm to the bite. 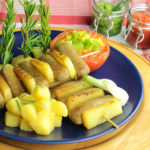 Briefly fry the Tiny Hot Dogs on a grill or heat up in a bain-marie. Wash the parsley. 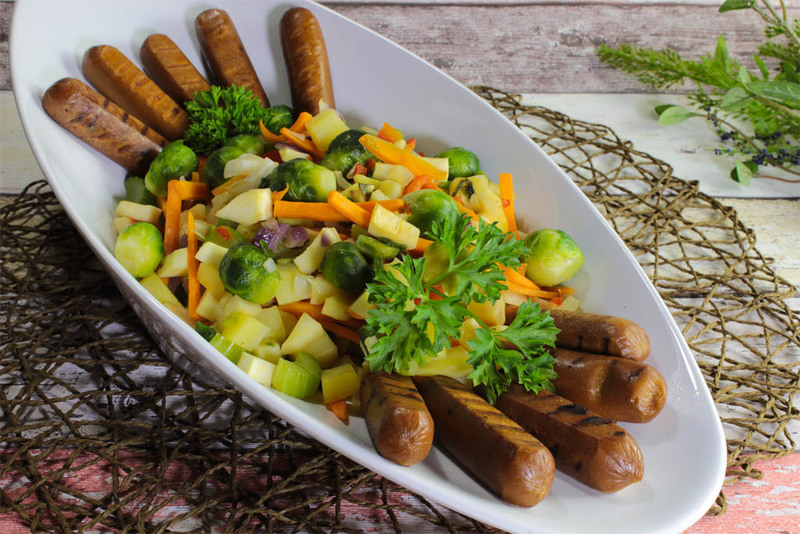 Pile up the vegetables on a plate, add the Tiny Hot Dogs and garnish with parsley. Then pour some coconut milk over the dish. Bon appetit!